The wedding cake is an important part of your big day, but where do you find the right baking specialist to create the cake of your dreams? 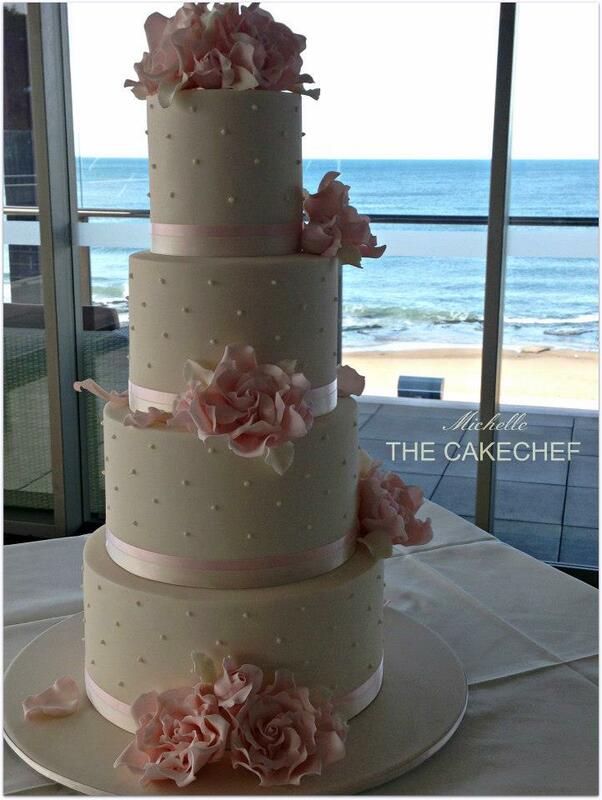 If you are a bride-to-be in and around Newcastle, Lake Macquarie, Port Stephens or the Hunter Valley, Michelle at The CakeChef is the person you’re looking for. Michelle is a qualified chef and has a Masters Degree in cake decorating. She will work with you to ensure your wedding cake not only looks fantastic, but tastes amazing too. You may know exactly what you want for your wedding cake, or you may still be combing magazines for inspiration. Either way, keep in mind it may take some planning and reviewing to turn your dream cake into a reality, so be sure to have the process underway well in advance of your wedding day. Ideally your cake should be ordered as soon as you have chosen your colour scheme and your venue. The CakeChef offers numerous cake flavours with ganache style fillings that you can mix and match to suit your taste. Imagine a Mars Bar mud cake with caramel flavours and dark chocolate ganache, or coconut mud cake with lemoncello ganache. Make an appointment for a cake tasting and be prepared to want every flavour you try! The CakeChef specialises in the popular double barrel and triple barrel wedding cake trend. Each cake or barrel is six inches high, and comprises four layers of cake and three layers of ganache. Cupcake towers are also still very much in demand as wedding cakes, and Michelle’s version can include a one or two-tier cutting cake. The days where a white tiered wedding cake with a generic plastic bride and groom perched on top as the only choice are gone, so get creative and consider coordinating your cake with your wedding theme, or the colour of your bridesmaid dresses, or the jewellery you’ll be wearing on your special day. Imagine your guests gasping in delight when they see your cake draped with the same pearls or rubies you are wearing, for example. This is especially effective if you’re wearing an heirloom piece of jewellery. Another current trend is to personalise your cake by matching it to the fabric of your wedding dress. For example, if your dress features an insert or overlay of lace, a fondant replica can be made and incorporated in your cake design to highlight your unique style. History tells us wedding cakes began as cakes of wheat or barley that were broken over the bride’s head to ensure fertility. Thankfully, times have changed and brides no longer have to worry about getting cake in their hair (although some YouTube wedding clips show differently!) and modern wedding cakes symbolise good luck for the newlyweds. However, it’s interesting to know the cutting of the cake is the first task you perform together as husband and wife, and feeding cake to each other traditionally signifies the commitment you have made to provide for each other. If you’re looking for a wedding cake specialist who can work with you, provide inspiration, and a really great tasting result, The CakeChef is the place to start. Whether you want something traditional or more modern, your wedding cake is one of the most memorable elements of your special day. If you’re getting married anywhere in the region, and looking for a wedding cake, you’re in luck. Thanks to Hunter Bride, beautiful, boutique Hunter Valley wedding cakes are just a few clicks away. Our directory listings offer you plenty of options for finding specialist wedding cake bakers, and we’ve also put together a few ideas for the perfect wedding cake experience, from deciding on the design, to transporting the finished product. These days, bakers can offer you a range of flavours, colours and decorations. Many of the specialist wedding cake providers listed in our directory offer an individual design service for each client. At your appointment, you can expect to discuss your ideas for how you’d like the cake to look, as well as enjoy a fabulous tasting experience. Looking at our wedding cake providers’ websites is guaranteed to give you some ideas and may well give you the munchies too! You will be surprised at the amazing cake designs on show, and seeing what’s possible might just spark your own creativity. Don’t hesitate to discuss your thoughts, because there is often a way to turn even the wildest idea into a fabulous cake! Other sources of ideas can be your wedding theme if you have one, wedding magazines, and social media galleries like Pinterest. 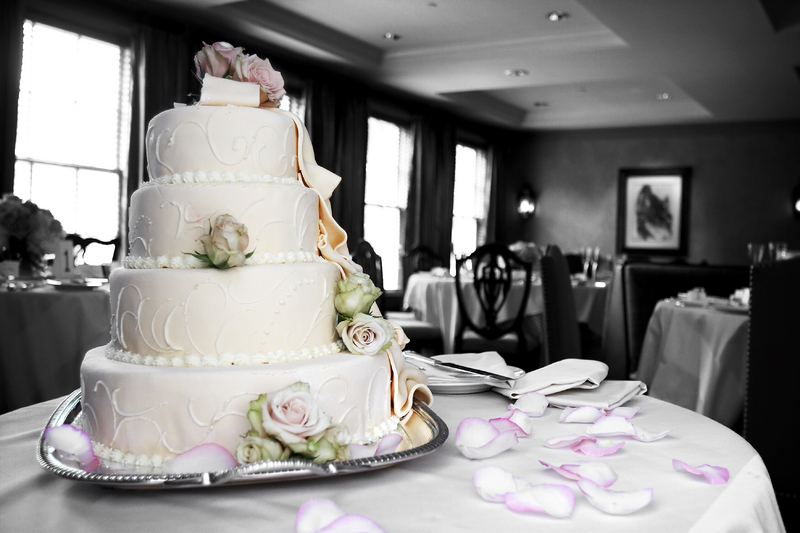 Many bakers are willing to accommodate fresh flowers as part of your wedding cake decoration. They may be able to source flowers for you, but if you want to make sure the flowers on your cake are the same as those in your bouquet or other wedding floral decorations, it probably makes more sense for your florist to provide them. There is quite a fashion for creating a ‘wedding cake’ from a tower of cupcakes, which can be a beautiful, individual solution. It makes for super easy serving, and you can indulge yourself with a variety of colours, textures and flavours. Not too keen on cake? A stunning alternative is to go for macaroons instead. These melt-in-the-mouth treats are so light they won’t weigh you or your guests down after your wedding meal. Is your cake going to be dessert? You’ll also want to decide whether your cake will form the dessert course, or if it is to be served separately with coffee. There are so many delicious flavour combinations that it is a very practical idea to serve your cake as the dessert. Doing away with a separate dessert course might also help lighten the load on your wedding budget too! Alternatively, serving your cake with coffee gives your guests a little something to nibble while they listen to the speeches. Generally it’s a good idea to have the cake delivered, and we’d certainly recommend it when you are having more than one tier to your cake, or planning a cupcake or macaroon tower. If you do collect the cake and set it up yourself, remember to keep it flat and drive cautiously! To make sure the cake is kept level, rest it on a towel, perhaps in the boot. The passenger seat isn’t flat so it’s not the best place to transport your cake – also you’ll be tempted to keep looking at it (yes, you will) and that could cause an accident! To help you select your cake from the yummy Hunter Valley wedding cakes on offer, our directory lists some of the best wedding cake providers in the area. Why not take a couple of girlfriends tasting with you, and make a party out of planning your wedding cake? Are you getting married in the fabulous Hunter region? There are lots of options when it comes to finding a specialist wedding cake baker in the Hunter Valley. The wedding cake is one of the most memorable elements of your special day, so it is worth taking the time to work with a professional to come up with something amazing. The cake can be as magical and fantastical, as elegant or as traditional as you wish (and these are not mutually exclusive categories by the way!). If you’re not really sure what you want, why not snap photos of things that inspire you, and add some of your favourite inspirations to a social media site like Pinterest? Being able to point to a series of pictures makes it super easy to discuss ideas with specialist bakers, as otherwise it can be hard to explain exactly what you want in words alone. Your wedding cake can uphold the classical tradition of tiers of fruitcake dressed with elegantly carved, romantic royal white icing. This type of cake fits with almost any wedding theme without fuss, and looks beautiful whatever the weather and time of year. White wedding cakes are also easily accessorised with subtle hints of colour in the decoration, which makes it a simple task to create colour harmony between your cake and your overall wedding colour scheme. Commissioning a wedding cake is also an opportunity to do something a little different. It can be an opportunity to have a bit of fun, and to create something that will amuse your guests, as well as look stunning. Surprising your guests with the unexpected is possible thanks to artisan sculpting techniques based around chocolate and icing. Today’s skilful wedding cake specialist is much more than just a great baker. Think of them as an artist and a sculptor too, and you’ll have a better idea of what can be achieved. A tiered wedding cake is one where several layers are separated by stands. These can range from intricate metal structures to clear plastic that resembles elegant glass stems, or white or coloured plastic to resemble classical columns. A stacked cake is where the tiers rest directly one on top of the other. These can be a terrific choice when you want a decorative scheme, such as icing sculpted to form the illusion of a piece of silk draped over the cake, to flow continuously from the top to the bottom of the cake. What if you have always wanted a spectacular, many-tiered wedding cake, but you’re only having a small wedding? You can in fact have your cake and eat it too, as the saying goes. Your baker can create the illusion of a cake with several tiers by adding so-called dummy tiers that are indistinguishable from the real thing. No one except you need ever know, because of course the wedding cake is always whisked away after the ceremonial first slice, to be cut up behind the scenes before being served to your guests. Of the many delightful properties of chocolate, some of the most useful when it comes to wedding cakes are the ways in which it can be carved, moulded and coloured. From fragile chocolate butterflies, to intricate model airplanes complete with chocolate wheels and a propeller, to chocolate ruffles and flourishes and simulated swags and folds of material, there’s almost no limit to what can be done with chocolate. Of course a wedding cake isn’t just about the outside, it needs to taste good too. The possibilities are almost endless when it comes to flavour, from traditional fruitcake to black forest, carrot or pretty much anything else! You may even want to consider different flavours for each layer. When you’re ready to commission your Hunter Valley wedding cake, our directory is waiting for you with listings of some of the best bakers around. Choosing your wedding cake can be one of the most fun parts of planning your wedding. After all, it’s not every day you get to commission a specialist baker to come up with a magical showstopping creation just for you! Thanks to modern baking techniques, it’s now possible to order almost any shape and style of cake you desire. That being said, the traditional tiered fruitcake with white icing is still popular. But whatever your dream cake, you are likely to see portfolios full of beautiful creations to choose from when you visit suppliers of wedding cakes. Newcastle is home to some fabulous wedding bakers. To save you time, we’ve listed specialist bakers of wedding cakes in Newcastle in our Hunter Bride directory. Before you narrow down a shortlist of bakers, get inspired by gathering together pictures of cakes that appeal to you. In discussing ideas for wedding cakes, Newcastle specialist bakers usually find it helpful if you come armed with something you like to show them. They can also offer suggestions, and make recommendations depending on the style of wedding, and also the time of year. Creamy filling in a cake at a summer wedding being held outside is probably not a good idea! Have you thought about a gorgeous wedding cake that includes highly personal references? What about a marzipan dog sitting by the bride and groom figures to represent a beloved pet? If both of you have a keen interest in common, you might create a quirky reference to it in the decoration. If you like scuba diving or dancing, for example, think tiny shoes or diving fins rather than traditional roses. This is really up to each couple. If tradition is important to you, you might ask a designer to copy the look of the cake your parents or grandparents had at their wedding. Or, you might want a cake that reflects your cultural background, such as a French croquembouche tower, or a Danish cornucopia cake. A wedding cake doesn’t have to be round, nor does it have to be tiered. A tower of individual cupcakes is a modern alternative, which allows for a number of different combinations in the flavour and presentation. This can be particularly helpful if you like several different cake samples, and you’re finding it hard to make up your mind! Remember that the really fun part of finding your perfect wedding cake is the sampling! Make sure you taste examples from prospective bakers before you commit to an order. It’s also a good idea to discuss the full reception menu with your cake designer, to avoid clashing or competing tastes. Is it time to taste? If we’ve whetted your appetite to start looking for bakers, click through to our listings for spectacular wedding cakes in Newcastle. The good news is that you are heading for some fabulous taste sensations. The bad news is you might need to fit in an extra trip to the gym after all that sampling! Every celebration deserves a cake, but the most special, most delectable, most beautiful cake, now that deserves a wedding. Traditionally, wedding cakes have been fruit cakes, presented in an ivory marzipan tier and topped with a miniature bride and groom. Some traditions have become temptingly unfettered however, and today the wedding cake may be classic, classy or creative. The choice is entirely yours. If your special day is approaching, there’s no better time to get to know the intricacies of baking and cake decorating. Not to prepare yourself of course (who has time for that!) but now you have the perfect excuse to become a cake connoisseur. Visit your cake supplier to view a range of samples, and even better, tantalise your taste buds. Fruit cakes are certainly an enduring choice, but there’s nothing stopping you from having a flavour adventure. How about a touch of the exotic with mango and coconut? Or perhaps you’re a devotee of the perpetually divine chocolate mud? When it comes to design, tiers are still popular but really, anything goes. Choose a shape to suit, the number of layers you desire, and your overall look. Do you desire refined and elegant or are you partial to unique and fun? Decoration may take the form of subtle touches in white, or perhaps a vibrant burst of colour. You might even finish it off with real ribbon, fresh flowers or a gorgeous diamante accessory. Whether you select an elegant cake to blend in with a perfectly themed wedding, or pick a fun and colourful centrepiece, it’s all about finding a cake to suit your day, and having a little fun in the process. The ultimate day deserves the ultimate cake, traditionally of course.